All orders placed with SoundOffAudio.com (internet, phone, fax, postal mail, and email) constitutes the acknowledgment and acceptance of all conditions listed on SoundOffAudio.com Price List and all conditions listed below. All parts shall remain the property of SoundOffAudio.com until paid for in full. All prices, availability, materials, design, and specifications are subject to change without notice. The following forms a legal agreement between you and SoundOffAudio.com (Sound Off). By using this site you are acknowledging that you have read, understood, and agree to be bound by these terms and all applicable laws and regulations. If you do not agree to these terms please do not use this site. The material provided on this site is protected by law, including, but not limited to, United States Copyright Law and international treaties. Any claim relating to the use of this site, its materials and any sales thereunder is governed by the law. Because each enclosure is hand-built, it may take UP TO 15 business days PLEASE CALL WITH QUESTIONS (excluding weekends and holidays) from the date payment is received for us to complete construction and carpeting of the enclosure. Orders may not be changed or refunded once construction has started. We can only accept returns for exchange of exact same type of enclosure, and only if the original enclosure was found to be defective by fault of Sound Off Audio. We can expedite your box order for a reasonable fee. 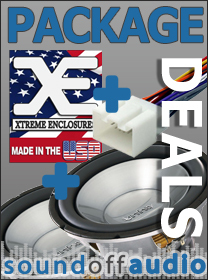 Subwoofer enclosures - We can only accept returns (within 30 days of shipment) for exchange of exact same type of enclosure, and only if the original enclosure was found to be defective by fault of Sound Off Audio. You must first obtain an approval from us if you wish to exchange an enclosure. Other items - All claims for damaged merchandise must be made with the shipping carrier. Please keep all shipping cartons and all packing materials for carrier inspection. SoundOffAudio.comcannot initiate any claims with the carrier. We can only accept returns and exchanges within THIRTHY (30) DAYS from the date of purchase on all orders from Sound Off Audio, Inc. APPROVAL MUST BE OBTAINED FROM SOUND OFF AUDIO, INC. BY EMAILING SALES@SOUNDOFFAUDIO.COM You must include your order number, full name on order, item you wish to return and your reason for wishing to return or exchange. All approved refunds for store credit will be paid either by Company Check, Credit Card Credit, or Account Credit, to be determined by Sound Off (SoundOffAudio.com). A 15% restocking fee will be assessed on all authorized returns. All special orders and custom orders will be processed in the most timely and efficient manner possible; however, SoundOffAudio.com will not be held responsible for delays above and beyond its control. No cancellations, refunds, or exchanges on special order items or custom order items. Any refused shipments sent back to SoundOffAudio.com does not constitute the right to a refund or credit. It is the customer's responsibility to make all arrangements with SoundOffAudio.com for refused shipments. It is company policy to charge the customer all freight charges associated with the shipment and a 20% restocking fee on all products shipped. SoundOffAudio.com defines abuse as, but not limited to, burnt voice coils (blackened, no continuity, melted adhesives, coil separated from the former, etc.) punctured or damaged surrounds, broken speaker terminals, non-PPI modifications, bent, chipped or broken frames, ripped spiders or damaged back plates. Speakers submitted with any of the above will be considered out of warranty. SoundOffAudio.com shall not be held liable for incidental loss of use, installation or removal and reinstallation charges associated with defective or returned product. Products that have been improperly installed may not be covered by this or any other warranty. We highly recommend having all car stereo equipment professionally installed. No warranty whatsoever will be valid if the defect was caused by customer's abuse, negligence, or mishandling. All merchandise sold by SoundOffAudio.com is only subject to manufacturer's warranty and conditions, if any, and is subject to submission to the manufacturer for inspection and approval for repair or replacement of merchandise. Customer, however, will be responsible for all shipping and handling fees. No labor or inconvenience may be included in any warranty claims. Check your state and local laws regarding the use on any parts. It is the customer's responsibility to retain any and all invoices for their record and warranty claims. The copyright in all material provided on this site is held by Sound Off (SoundOffAudio.com). Except as stated herein, none of the material may be copied, reproduced, distributed, republished, downloaded, displayed, posted or transmitted in any form or by any means including, but not limited to, electronic, mechanical, photocopying, recording, or otherwise without the prior written permission of Sound Off (SoundOffAudio.com). You do NOT have Permission to display, copy or distribute and download the materials on this site for personal or commercial use. You can not "mirror" any material contained on this site. Any unauthorized use of any material contained on this site may violate copyright laws, trademark laws, and various other regulations and statutes. The trademarks, service marks and logos (the "Trademarks") used and displayed on this site are registered and unregistered Trademarks of SoundOffAudio.com and others. Nothing on this site should be construed as granting, by implication, estoppel, or otherwise, any license or right to use any Trademark displayed on this site without the written permission of the Trademark owner. SoundOffAudio.com enforces its intellectual property rights to the fullest extent of the law. SoundOffAudio.com prohibits use of the SoundOffAudio.com logo as a "hot" link to the SoundOffAudio.com site unless establishment of such a link is approved in advance by SoundOffAudio.com in writing. THIS WEBSITE AND THE INFORMATION PROVIDED HEREIN ARE PROVIDED "AS IS" WITHOUT WARRANTIES OF ANY KIND EITHER EXPRESS OR IMPLIED. TO THE FULLEST EXTENT POSSIBLE PURSUANT TO THE APPLICABLE LAW, SoundOffAudio.comDISCLAIMS ALL WARRANTIES, EXPRESSED OR IMPLIED, INCLUDING, BUT NOT LIMITED TO, IMPLIED WARRANTIES OF MERCHANT ABILITY, FITNESS FOR A PARTICULAR PURPOSE, NON-INFRINGEMENT OR OTHER VIOLATION OF RIGHTS. SoundOffAudio.com DOES NOT WARRANT OR MAKE ANY REPRESENTATIONS REGARDING THE USE, VALIDITY, ACCURACY, OR RELIABILITY OF, OR THE RESULTS OF THE USE OF, OR OTHERWISE RESPECTING, THE MATERIALS OR PRODUCTS ON THIS SITE OR ANY SITES LINKED TO THIS SITE. UNDER NO CIRCUMSTANCES, INCLUDING, BUT NOT LIMITED TO, NEGLIGENCE, SHALL SoundOffAudio.com BE LIABLE FOR ANY DIRECT, INDIRECT, SPECIAL, INCIDENTAL OR CONSEQUENTIAL DAMAGES, INCLUDING, BUT NOT LIMITED TO, HARM TO EQUIPMENT AND/OR PERSONAL INJURY OR DEATH, ARISING OUT OF THE USE, OR THE INABILITY TO USE, THE MATERIALS ON THIS SITE, EVEN IF SoundOffAudio.com OR A SoundOffAudio.com AUTHORIZED REPRESENTATIVE HAS BEEN ADVISED OF THE POSSIBILITY OF SUCH DAMAGES. IF YOUR USE OF MATERIALS FROM THIS SITE RESULT IN THE NEED FOR SERVICING, REPAIR OR CORRECTION OF ANY ITEM YOU ASSUME ANY COST THEREOF. SOME STATES DO NOT ALLOW THE EXCLUSION OR LIMITATION OF INCIDENTAL OR CONSEQUENTIAL DAMAGES, SO THE ABOVE LIMITATION OR EXCLUSION MAY NOT APPLY TO YOU. In the event a product is listed at an incorrect price due to a typographical error, entry error or error in pricing information received from our suppliers, SoundOffAudio.com shall have the right to refuse or cancel any orders placed for said product(s). Although your credit card normally is not charged prior to shipping an order, if your credit card has already been charged for the purchase and the order is canceled SoundOffAudio.com will immediately issue a credit to your credit card account in the amount of the incorrect price. Some products may differ from those that appear on the website, but do contain similar features. Your receipt of an electronic or other form of order confirmation does not signify our acceptance of your order, nor does it constitute confirmation of our offer to sell. SoundOffAudio.com reserves the right at any time after receipt of your order to accept or decline your order for any reason. All orders shipped to any address within Florida must pay sales tax. SoundOffAudio.com may at any time revise these Terms of Service by updating this posting. By using this site, you agree to be bound by any such revisions and should therefore periodically visit this page to determine the current Terms of Service to which you are bound.